Have a "Staycation" vacation! 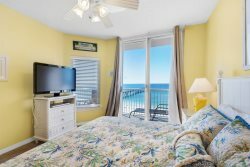 Enjoy the pristine waters of the Emerald coast from this 17th floor penthouse; A three bedroom, three bathroom vacation rental located at the east building of the Beach Colony Resort on Navarre Beach. Escape the day-to-day commotion or plan a family get together, girls trip or romantic getaway. Decorated in warm earth tones, this unit is guaranteed to make anyone feel right at home. The master bedroom is a perfect retreat with a king bed, private bathroom with Jacuzzi tub and walk-in shower, and access to the large ocean front balcony. The guest rooms are perfect for the family: with queen bed in the first guest bedroom, and a twin over full bunk in the second guest bedroom. Flat Screen TVs, updated light fixtures and more await you here on the amazing emerald coast of Navarre. Book your "Staycation" today with Navarre Properties and leave Navarre Beach as happy as a clam! Staff is always helpful... big thanks go out to NP for handling our forwarded mail for 2 months !!! Friendly and very accommodating. One of our travelers was sick will traveling and despite the unit not being available until 5, they fast tracked the cleaning and permitted us to enter early to make the sick guest more comfortable. Amazing stay. Navarre has quickly become my family's favorite places. We love the beach and the family oriented environment, private beach, and safety we enjoy when we visit. Jonathon, Sarah and Shahkyra were very congenial and friendly.